Real Kukui Hawaiian Leis handpainted and from Hawaii. Beautiful vibrant colors. The Kukui Nuts are polished to a high glossy shine. 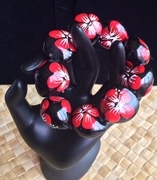 In ancient times, the Kukui Nut was held in high regard and was reserved, to be worn by the ali`i (reigning chiefs of Hawaii). Today, kukui nut leis are by far the most popular lei "hua" (seed or nut lei) in Hawaii. They are worn by both Kane (men) & Wahine (women. Wear them at Weddings, for Graduations, parties and to celebrate friendships. Length is approx 8-10 nuts.